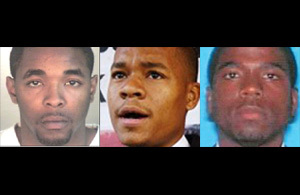 OAKLAND — A Superior Court judge on Monday gave lawyers for accused triple killers Yusuf Bey IV and Antoine Mackey two weeks to submit papers for a long-delayed change-of-venue motion or he would drop the matter and schedule the case for trial. Mackey’s lawyer, Gary Sirbu, asked Judge Morris Jacobson for more time, saying he had been in ill health. But Jacobson refused, saying a hearing on the motion has already been postponed four times before Sirbu became ill. If papers aren’t filed “by Aug. 2, I’ll deem the motion dropped. I can’t be any clearer than that. I want to get this motion out of the way so we can focus on a trial date,” Jacobson said. A hearing on the motion had been scheduled to start Tuesday. It will now begin Aug. 23 under a new schedule Jacobson set Monday. A trial date cannot be set until Jacobson rules on whether the case should be moved to another county on arguments that the news coverage has influenced potential jurors. Bey IV is charged with ordering the killing of journalist Chauncey Bailey and two other men in 2007. Mackey is charged with shooting one of them and assisting the killer of the other two. Outside of court Sirbu declined to discuss Jacobson’s comments other than to say he obviously disagreed. The venue hearing was delayed in April when Bey IV’s then-lawyer, Lorna Brown, resigned from the case. She is being investigated for smuggling legal papers out of the Santa Rita Jail in Dublin on which Bey IV is suspected of marking the names of witnesses he wanted killed. It remained unclear Monday when a trial would begin even after the venue hearing. A new prosecutor, Melissa Krum, is now assigned to the case, replacing Christopher Lamiero, who asked to be reassigned to a less stressful position so he can spend more time with his family. Bey IV and Mackey were indicted on three murder charges each last year when a bakery follower, who has admitted killing Bailey, struck a plea deal with a prosecution team headed by Lamiero. Krum told Jacobson she doesn’t intend to call any witnesses at the venue hearing; Jacobson said he would try to complete it within two days. Sirbu said he and Bey IV’s lawyer, Gene Peretti, expect to call one expert witness.